This takeoff dish has all the delicious flavor of a Chinese egg roll without any of the bad stuff. 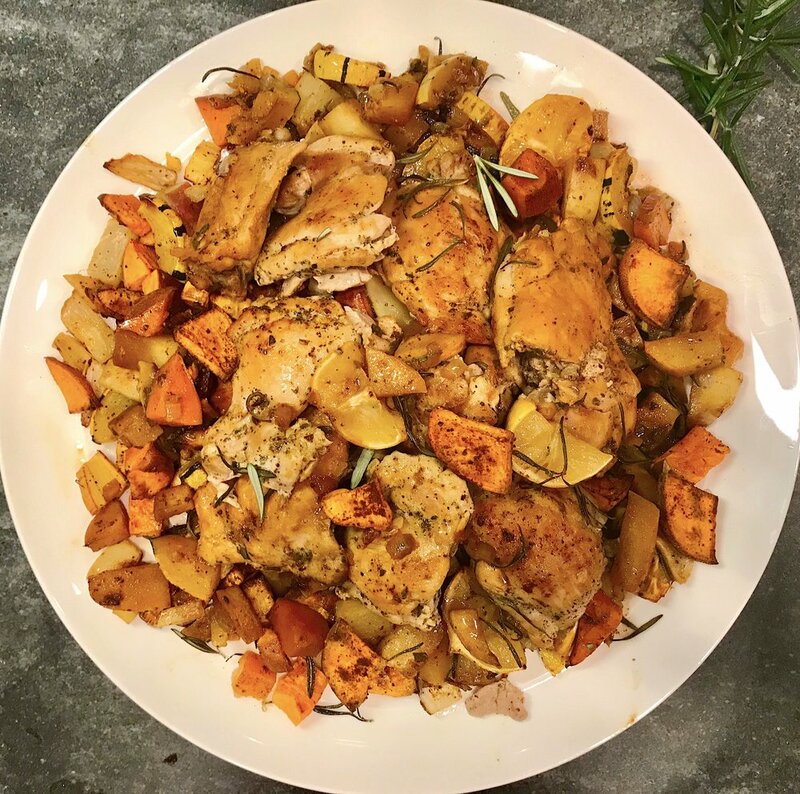 Simple, fresh, healthy family-friendly dinner in one-skillet that your entire crew will love! Heat 1 tbsp. oil in a large, deep skillet or Dutch oven (I like to use a cast iron skillet) over medium heat. Cook meat until browned. Add another tbsp. of oil, add onions and cook for a few min. Add carrots, garlic, mushrooms and spices and sauté until softened, about another 4-5 min. Add broth to pan and stir well. Add cabbage, coconut aminos and tamari and cook until cabbage wilts. Add toasted sesame oil and season with salt and pepper and adjust any flavorings as desired. Serve over rice or quinoa, garnish with green onions and enjoy! A delicious, healthier, low-carb, veggie packed version of everyone’s favorite take-out dish. I love how this turned out with so much flavor, even your picky eaters will love it! Cut spaghetti squash in half lengthwise, scoop out seeds and stringy part. Rub 1 tsp. avocado, coconut, olive oil or melted ghee on inside of each squash halve and put on baking tray. Bake for approximately 30-40 minutes until center of squash is tender and using a fork, scrape out the inside of squash to get strands of spaghetti and place in a bowl. Set aside. While squash is cooking place chicken breasts into a saucepan and pour enough water to cover them. Place over medium heat, bring to a boil, and simmer until chicken meat is no longer pink, about 10-12 minutes. Transfer chicken to a bowl. Let cool for a few minutes and then shred the chicken with 2 forks and set aside. Heat 2 tbsp. sesame oil in a large pan over medium heat. (I use a cast iron skillet) Add in the garlic and onion and sauté until onion has softened, about 5 min. Next add in the broccoli and cauliflower florets and carrots and sauté for a few more minutes. Then add in the ginger and cabbage and continue to sauté until everything is tender and the cabbage is wilted. In a small saucepan combine the ingredients for the sauce and bring to a boil. Lower the heat and let it simmer for a few minutes. Add the squash, green onions and shredded chicken to the pan with the vegetables. Finally pour the sauce over everything and stir until well combined. Garnish with a sprinkle of green onions before serving. This bowl is delicious, packed with protein, healthy fats and easy to throw together because all the veggies take approximately the same amount of time to cook so they can be roasted on the same pan. When they’re ready just put in a bowl with quinoa, avocado, pumpkin seeds and drizzle with tahini dressing. As always feel free to substitute with any other veggies of your choice but this combo works great together. Toss cauliflower, broccoli, Brussels sprouts, onion and squash with oil/ghee and spread on baking sheet. Roast for 30 minutes, tossing halfway during cooking time. Remove any veggies that are lightly browned and continue to roast the rest until done checking every few minutes to avoid burning. In a bowl combine the garlic and lemon juice. Let mixture rest for at least 10 minutes, to give the garlic time to infuse the lemon juice with flavor. This recipe is the perfect staple to have on hand. It’s healthy, quick, easy and delicious. It’s great for college students going back to school or graduates living on their own and cooking for the first time. It’s also ideal for nights when the rest of your family is eating something you don’t want to feed yourself. Play around with toppings depending on your mood or whatever you have in your fridge at the time. Spread zucchini and mushrooms on baking sheet and drizzle with olive or avocado oil, season generously with salt and pepper. Bake for 12-15 minutes, until just starting to brown. Toss halfway during cooking. Remove from oven and sprinkle with nutritional yeast. Mix well and set aside. Fill small saucepan with water and bring to boil. Gently place eggs in water and boil for exactly 7 minutes so that the yolk will be runny when done. While eggs are cooking fill another small bowl with ice water and when timer is done for eggs immediately place boiled eggs in ice water to stop them from cooking. After about a minute, remove eggs from water and peel shells. Put noodles and mushrooms in a bowl. Add sliced avocado and place eggs on top and cut open. Sprinkle with sesame seeds. Season with additional salt and pepper if needed and serve immediately. Many of my clients say that they find lunch the most challenging in terms of what they’re in the mood for, what’s easy to make, delicious and satisfying. This bowl addresses all of that and is a great solution for lunch or dinner, super easy to make and has the perfect combination of protein, healthy fats, and fiber. I could eat it everyday – perhaps rotating things here and there depending on what I’m in the mood for! The best part is you can prepare all the vegetables once and then use a portion each day to make your bowl. Toss sweet potatoes with about 1 tbsp. olive oil in a bowl and then spread on baking sheet. Repeat with sunchokes and shitake mushrooms. Roast veggies until lightly browned. Mushrooms take about 15 minutes and sweet potatoes and sunchokes take between 35-45 minutes. Check veggies every 15 minutes or so, flip on baking sheet and remove when done. Place broccoli in a steamer basket over boiling water and steam until bright green and crisp, about 3 minutes. Toss lightly with olive oil and a pinch of salt. Set aside. In another bowl toss lettuces with olive oil, apple cider vinegar and nutritional yeast. Season with salt and pepper. Assemble the bowl beginning with lettuces on the bottom. Top with ¼ of the sweet potatoes, mushrooms, sunchokes, kale, broccoli, avocado and about 4-6 ounces of cut up chicken. Season with salt and pepper. Sprinkle with black and white sesame seeds. Drizzle with olive oil (optional), dig in and enjoy! Store the remaining cooked veggies and chicken in the refrigerator to use throughout the week. 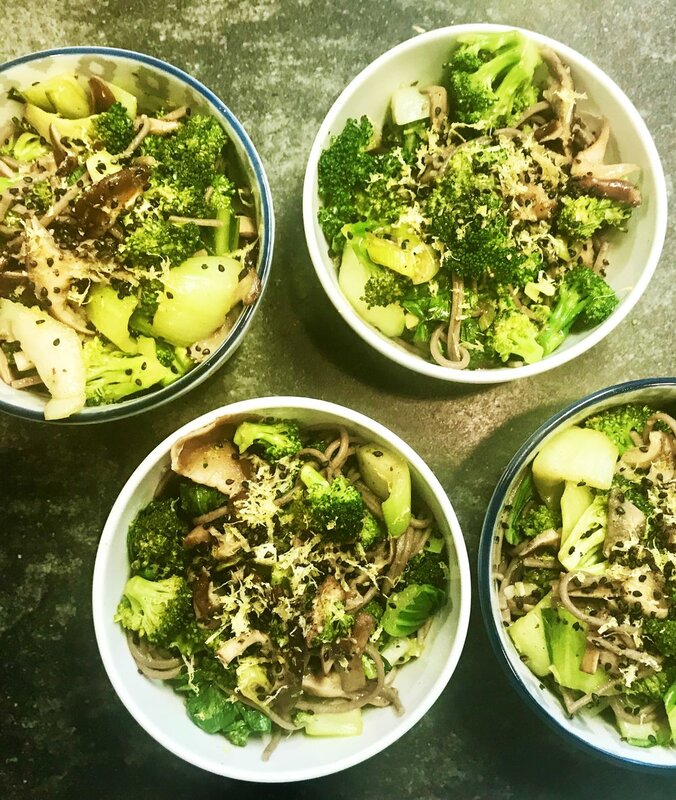 Bowls are a great go-to when you want to throw something together that’s quick, nourishing and delicious. 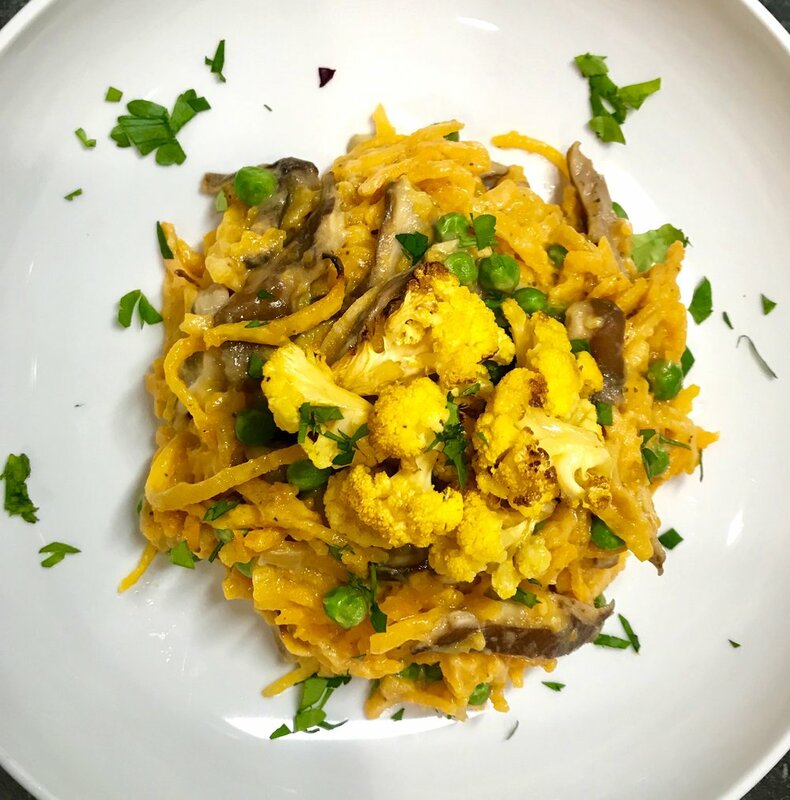 I made this bowl for a meatless “Monday” night but it’s a great one to add another protein like eggs, wild salmon or any other protein you that like. This one has my favorites like wild mushrooms and Kobucha squash with a yummy sesame-ginger sauce that has just the right kick to it. Rinse and drain the quinoa. Add rinsed quinoa, 1 tsp. salt, and vegetable broth to a small saucepan and bring to boil over high heat. Turn heat down to low, cover and simmer for approximately 15-20 minutes, until liquid is dissolved. Arrange squash in a single layer on baking sheet. Coat both sides on squash with oil or ghee and sprinkle with salt and pepper. Roast until starting to brown and caramelize, about 40 minutes, flipping with a spatula about halfway through. In a small bowl, combine all the ingredients for the sauce. Set aside. In a large sauté pan (I like to use my cast iron skillet) melt another tbsp. oil on medium-high heat. Add the mushrooms, sauté for a few minutes. Then add the onion and garlic and sauté for 2-3 minutes. Next add the cauliflower and cook until beginning to soften, about 5 min. Add a little bit of the sauce. Next, add broccoli and kale. Sauté everything for a few minutes, mixing well until combined and add the rest of the sauce to the vegetables and cook for about 5 minutes. Assemble the bowl beginning with quinoa on the bottom. Top with vegetable mixture, squash and ¼-1/2 avocado. Add lime/lemon wedges to squeeze over bowl. Finally drizzle with sesame oil (optional) and enjoy! I love using sweet potato toast as a bread substitute! Whether you’re are gluten-free or trying to add more fiber to your diet, sweet potato toast lends a richness and subtle sweetness to whatever fillings you choose to use. Another big advantage is the added nutrition you get! Sweet potatoes contain beta-carotene, which gets converted into vitamin A in our body. Vitamin A is important for hair, skin, nails, vision, and plays a key role in immune function. Combine them with protein and a healthy fat and you have a seriously nutrient-packed and delicious sandwich! Place sweet potato slices in a toaster on high for about 5 minutes or until cooked through. You may need to toast multiple times depending on the length of your toaster settings. When sweet potato is ready top with lettuce, turkey, avocado slices and mayo. Easiest recipe ever! Wild Salmon covered in delicious spices and then slow baked so that it melts in your mouth, is impossible to overcook and comes out so flavorful! I served it over zucchini noodles with shitake mushrooms for an omega-3 packed, heart-healthy, gluten-free dish. This salmon recipe is also great paired with any salad, whole grain or roasted vegetables. This recipe is dairy-free but if you are not looking to avoid dairy feel free to sub regular organic milk, grass-fed butter and Parmesan cheese. Preheat oven to 270 degrees. Line a baking sheet with parchment paper. Combine chili powder, paprika, oregano and salt. Place salmon on parchment paper and sprinkle with seasoning mixture. Drizzle with olive oil. Bake for 30 minutes. While salmon is baking, place pumpkin seeds, salt, garlic, milk, lemon juice and nutritional yeast in a high-speed blender until creamy. Add more salt or pepper to taste. Pour contents of blender into a small saucepan, add arrowroot and cook over low heat, stirring regularly, until sauce thickens, about 3-4 min. Heat a large skillet over medium heat. Heat ghee or olive oil and add mushrooms. Sauté 3-4 minutes, turning until lightly browned. Season to taste with salt and pepper. Add zucchini noodles and sauce to skillet. Stir until everything is well coated. Plate zoodles, sprinkle with red pepper flakes and top with salmon, fresh dill and lemon slices. I love a really good chicken salad. It’s so helpful to have a batch made to use all week – on toasted nut/whole grainy bread, scooped on top of a salad, eaten with crackers or just straight from the fridge. However, chicken salad is so subjective, everyone enjoys it in different ways: ground up/chunky, with/without nuts, with/without celery etc. Because of the innumerable combinations, I won’t even consider claiming this recipe as the best, but I will say it’s pretty delicious. The great thing is you can use it as a basis for your own and add whatever ingredients you want. And if your family is anything like mine, none of us likes it the same way. I will add walnuts and maybe chopped apple to mine, but my daughter wants it as is – plain and simple. My inspiration for this recipe comes from a very delicious and very expensive chicken salad that I buy from a local organic market in my town. It’s a pretty small container so I would hide it from my family so I didn’t have to share! I realized it was time to make my own. It’s creamy, delicious and made with only heart-healthy olive oil and none of the inflammatory vegetable oils store bought mayo is made with. Brine chicken breasts (this makes them juicy and super flavorful): Fill a large bowl with enough water to cover the chicken. Add ¼ cup sea salt. Stir to combine until most of the salt is absorbed. Add the chicken breasts and let them sit in the mixture for 15 minutes. Or if you have the time you can also cover the bowl and refrigerate for up to 6 hours. Remove the chicken breasts from the brine, rinse them with cold water and pat them dry with paper towels. (Some store-bought chicken breasts are now sold pre-brined. So double-check your packaging before doing this step. If it has already been pre-brined in a sodium solution you can skip this step. Place chicken breasts in a single layer in a large baking dish. Brush with oil. Combine salt, pepper and garlic powder and sprinkle mixture evenly over the chicken. Bake for 15-18 minutes, or until chicken is cooked through and no longer pink. If you use a cooking thermometer, measure the temperature at the thickest part of the breast, it should be at least 165 degrees F.
Remove from oven and set chicken aside. Prepare the mayonnaise: (made with heart healthy olive oil instead of highly processed and inflammatory vegetable or soybean oils and some form of sugar). Combine egg, mustard, vinegar, ¼ cup olive oil and salt in a bowl. Using an immersion blender pulse for a minute to break up the egg. With the blender running, add the first ¼ cup of oil a little at a time. Make sure each addition of oil is blended in before adding the next. The mixture will start to emulsify. Once the first ½ cup of oil has been added, you can add the rest more quickly. Add as much of the oil as needed to reach the consistency you prefer. The more oil you add, the thicker the mayo will become. You may not need to use all the oil to reach your desired thickness. Tear cooked chicken into bite size pieces and put it into a big bowl. Add the rest of the ingredients and mix together. Then add about half the mayonnaise. Give everything a good toss. Adjust seasoning if needed. Canned Wild Alaskan Salmon is an excellent source of omega 3 fatty acids that are essential for optimal health. This super easy-to-make wrap with avocado is so deliciously satisfying and makes a perfect healthy lunch or dinner! In a medium bowl, combine salmon, mayonnaise, celery, lemon juice, dill, salt and pepper. Lay collard green flat and scoop salmon salad into the middle. Add a couple of slices of avocado and roll into a wrap. Fall never tasted so good! 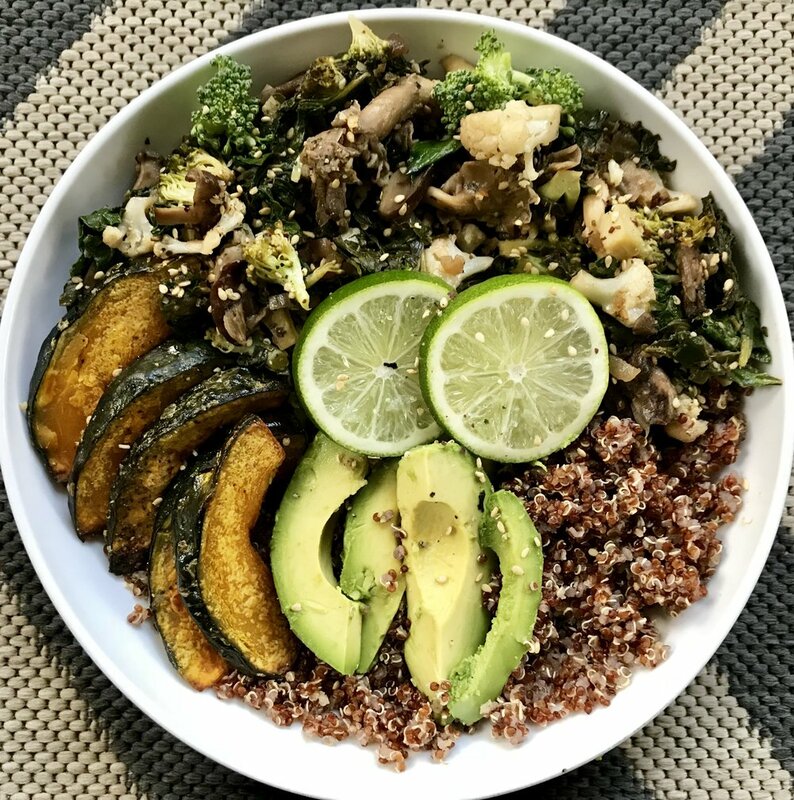 This high fiber, anti-oxidant and protein-rich veggie bowl is so yummy it will immediately become a favorite in your house! All of the veggies are in season, which means they’re healthier, have richer flavor and are generally more cost effective. Everything takes about the same time to roast, which makes these bowls very easy to throw together. Once everything is cooked, I set it all out on the counter and everyone in my family makes their own bowl with whatever ingredients they want in it. This is a picture and the recipe of my bowl, which is also perfect for a meatless Monday dish! 3 cups greens of your choice – Kale, Arugula, Swiss Chard etc. Rinse and drain the Quinoa. Add rinsed Quinoa, 1 tsp. salt, and vegetable broth to a small saucepan and bring to boil over high heat. Turn heat down to low, cover and simmer for approximately 15-20 minutes, until liquid is dissolved. Let sit for a few minutes, fluff with a fork and set aside. Scrub sunchokes under running water and cut into ¼ inch thick pieces. Toss with olive oil, salt, pepper, rosemary and sage and arrange on baking sheet. Roast for about 40 minutes, checking and turning on the baking sheet half way through until tender and golden brown. Mix 2 tbsp. olive oil, Dijon mustard, salt, and red pepper flakes and toss with brussel sprouts until evenly coated. Spread on baking sheet and roast until wilted and lightly browned, about 40 minutes, checking and turning half way through. Clean by running under water and scrubbing away any dirt with your hands. Cut and remove seeds and arrange squash in a single layer on baking sheet. Coat both sides on squash with olive oil and sprinkle with salt and pepper. While quinoa and the rest of the ingredients are roasting, preheat a large skillet with 2 tablespoons of olive oil. Add garlic and sauté for 1 min. Add greens and cook for approx. 3-5 minutes until wilted. Season with salt and pepper to taste. Remove from heat and sprinkle with black and white sesame seeds. Assemble the bowl beginning with greens on the bottom. Top with a scoop of quinoa, brussel sprouts, squash, sunchokes, chickpeas, ¼ Avocado, sesame seeds and sliced beets. Finally drizzle with cashew cream (optional) and enjoy! This spicy shrimp recipe is a new winner in my house! It has a ton of flavor, is packed with good-for-you ingredients and couldn’t be easier to make! 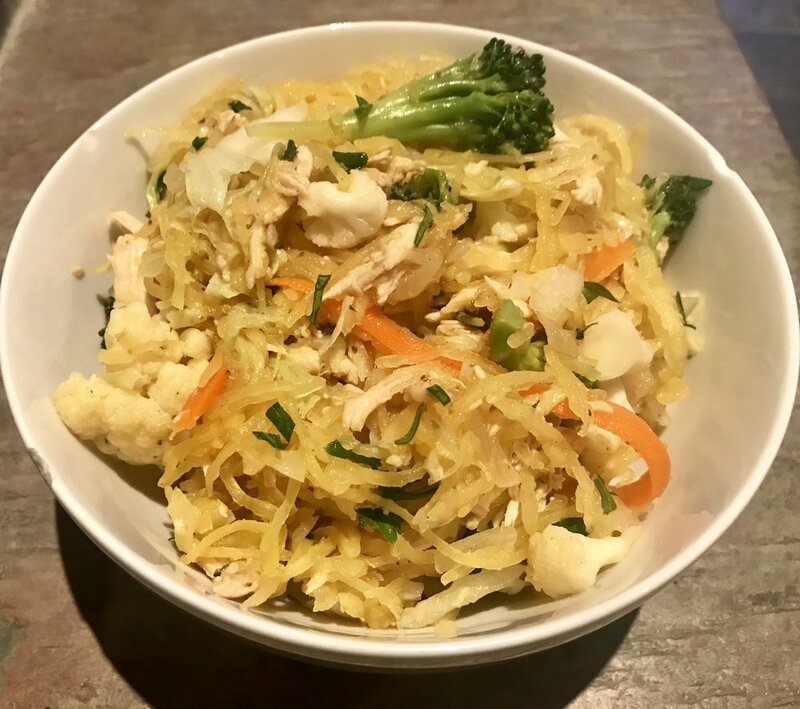 It’s delicious served over any type of pasta or I love tossing it with zucchini noodles for a heart-healthy, gluten-free dish! To make the pesto combine the basil, garlic, nuts, cheese (optional) or nutritional yeast (also optional) and about ¼ cup olive oil in a food processor or high-speed blender. Process, occasionally stopping to scrape down the sides of the container. Continue to process and slowly add another ¼ cup of olive oil. Remove pesto from container and set aside. Heat large skilled on medium-high heat until hot. Add 1 tablespoon olive oil – it should run without sizzling. Add shrimp, season with ¼ tsp. salt and ¼ tsp. red pepper flakes. Cook for about 3 minutes, turning once midway, until shrimp is pink and cooked through. Remove shrimp from skillet. In the same skillet add another tablespoon of olive oil. Add mushrooms and season with ¼ tsp. salt. Cook, stirring, until mushrooms release liquid and begin to get soft, for about a minute or two. Then add half of the chicken broth, cook for another 2 minutes and add back the cooked shrimp. Finally, add the rest of the chicken broth and ½ cup pesto. On medium heat, mix everything to combine and remove from heat. Serve over pasta or zoodles, topping the shrimp with chopped fresh basil.